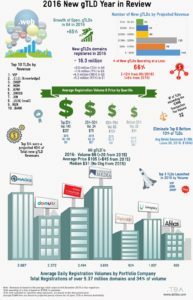 Generic Top Level Domain Registration Volume Jan 2015, there are 487 delegated new gTLDs. 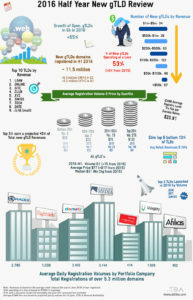 .XYZ is still at the top spot with 3,015 daily registrations and the first TLD to reach 750.000 registrations. .网址 (.xn--ses554g meaning ‘web’) has almost tripled in its average daily registrations from 505 last month to 1,681 in January. .REALTOR who offers realtors a free registration program has 806 daily registrations. .TOP has an average registration volume of 661 daily registrations. .CLUB is in fifth place with 538 daily registrations. .BERLIN closes January with approximately 10,000 registrations behind .club with 486 daily registrations which includes a portion that are free. .OVH, declines slightly from December with an average of 477 registrations per day (OVH is a web hosting company offering its clients a discounted or free domain). .WANG increases to 466 daily registrations which is up from 399 over last month. .WORLD makes a first appearance in the top ten with an average of 311 daily registrations. .NYC finishes the top ten with 307 daily registrations, slightly up from last month at 302. .LONDON is still behind .NYC but falls off the top ten list slightly down to 296 daily registrations. 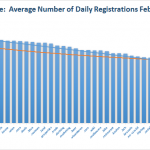 Overall, there has been an increase in the number of daily registrations in January but still below the November daily registration numbers. The top quartile has increased by an average of 192 registrations which is up from 177 in December. 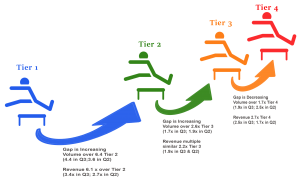 The remaining quartiles has minor changes. The second quartile increased from 29 to 30 daily registrations. 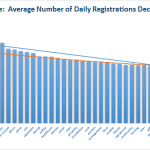 The third quartile of registries has an average daily registration volume of 14 where the fourth quartile has decreased further to five registrations per day. The overall daily registration average of all gTLDs is now 61 up from 56 in December but still significantly down from November with an average of over 90.